Coverage: Live text commentary on every match on the BBC Sport website and mobile app. 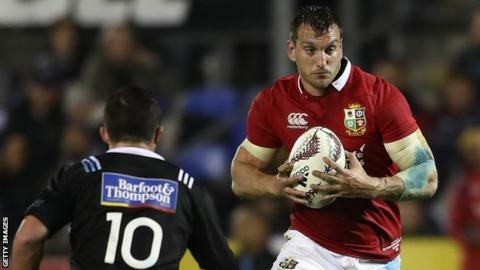 Captain Sam Warburton was not considered for Saturday's British and Irish Lions match against Crusaders. Coach Warren Gatland revealed the Wales flanker injured an ankle in the 13-7 win over Provincial Barbarians. Fly-half Dan Biggar (head injury) and Ross Moriarty (back spasm) were also ruled out for the game against the best team in Super Rugby. "Sam has a little bit of a slight ankle strain after that game which was pretty sore," said Gatland. "So he's just been resting that and needs a few more days." The Lions will be captained by Alun Wyn Jones in Canterbury. Jones took over the Wales captaincy from Warburton for the 2017 Six Nations. Warburton missed the end of the domestic season in Wales after injuring a knee playing for Cardiff Blues in early April. His appearance for the Lions on 3 June was his first match since then. Biggar failed a head injury assessment after being heavily tackled in the Lions' 22-16 loss against Blues on Wednesday. It's the second time in two months that the Ospreys player has had to go through return-to-play protocols following a blow to the head. He missed the region's Welsh derby with Cardiff Blues in April after he was injured playing against Leinster. However, Gatland has said he's confident Biggar will be fine to continue the tour. "Dan Biggar's a six-day turnaround," he said. "It's just the protocols so he wasn't available for consideration this week and Ross Moriarty had a back spasm in the first game but he's recovering well." What went wrong for the Lions v Blues? Read more on What went wrong for the British and Irish Lions against Blues?